Spring has always been a season for new beginnings. This year is a great example for a Sutherlin High graduate and a Roseburg High senior who are preparing for new careers with job skills honed through two local companies. SHS grad Taelor Carson and RHS senior Kurt Phillips are pursuing fields that may not appear to have a lot in common with their recent duties. But both teens say they gained valuable experience from their Douglas County employers, through jobs that came about because of industry partnerships with school Career & Technical Education programs. 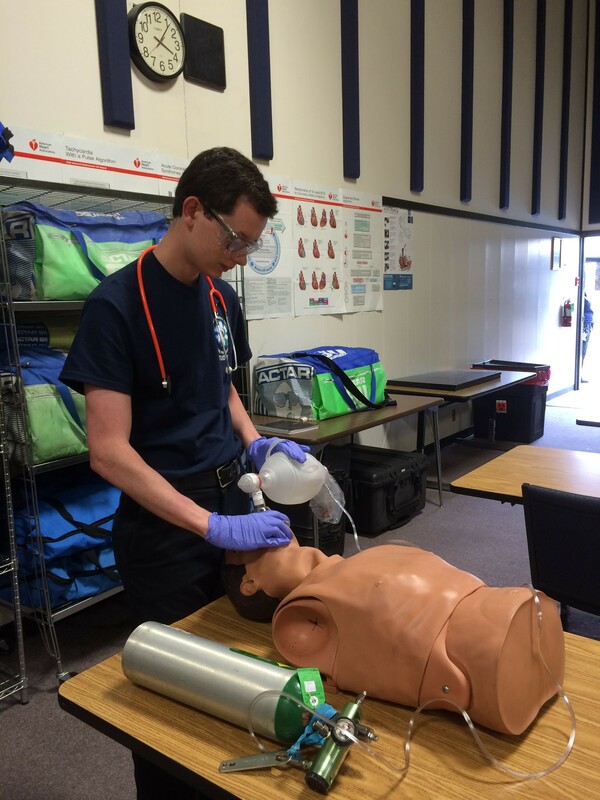 Roseburg High senior Kurt Phillips practices CPR at an Umpqua Community College EMT class. Taelor Carson sands a cabinet panel at Woodgrains and Stone Inc. in Sutherlin. For Carson, 19, working at Woodgrains and Stone Inc. in Sutherlin for nine months provided a bridge to a training program at Northwest Lineman College in Meridian, Idaho. The program he entered in April is aimed at helping trainees qualify for apprenticeships as electrical lineworkers. The college’s website describes them as workers who “construct, maintain and operate America’s power grid.” Ultimately, Carson said, he’d like work for the private sector, perhaps traveling to various sites to repair storm damage to power lines. 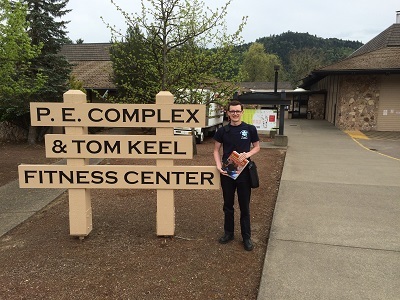 Eighteen-year-old Phillips finished up a two-year paid internship in late March at Roseburg’s North River Boats. He’s enrolled in EMT classes at Umpqua Community College with the goal of entering UCC’s two-year paramedics program. “I’ll be mixing fire science in that, too. My goal is to be a firefighter paramedic,” he said. Both Carson and Phillips say their CTE classes allowed them to connect with subjects that clicked with their interests and abilities. Carson said his interest in CTE stretched back to middle school. “I would see high schoolers always making cool stuff, and I always said I wanted to make cool stuff for myself when I went to high school,” he said. 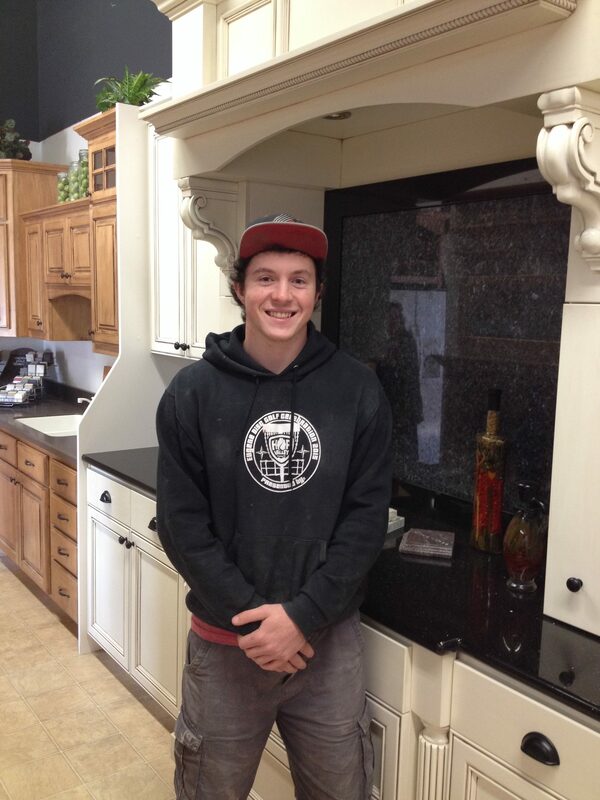 That came true for Carson at a Sutherlin High woodshop course under instructor Josh Gary. Carson worked on a series of smaller projects that he found fun, but also potentially useful. 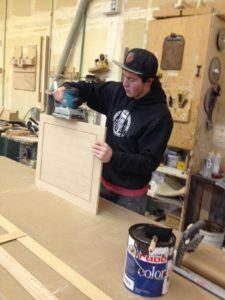 “It crossed my mind when I was creating dartboard casings that these are some useful skills that will translate into jobs I might get or apply for,” he recalled. Carson cited his woodshop experience on the job application that led to his employment at Woodgrains in the summer of 2015. During his time at Woodgrains, Carson drove a delivery truck, unloaded freight, sanded, glazed, stained and cut materials in the shop. He appreciated the chance to learn how to operate shop machinery, but said his delivery driving taught him people skills. Taelor Carson stands in the Woodgrains showroom a couple of weeks before heading to Northwest Lineman College in Idaho. “I was kind of shy at first, but when you do deliveries, you learn how to talk to people in a businesslike and polite way,” he said. Company owner Brent Atkinson said although the connection with Sutherlin High CTE was forged before his recent purchase of the former Woodgrains Inc., he has reached out to the high school himself with a view to doing more local hiring. A second SHS grad is still working at Woodgrains. 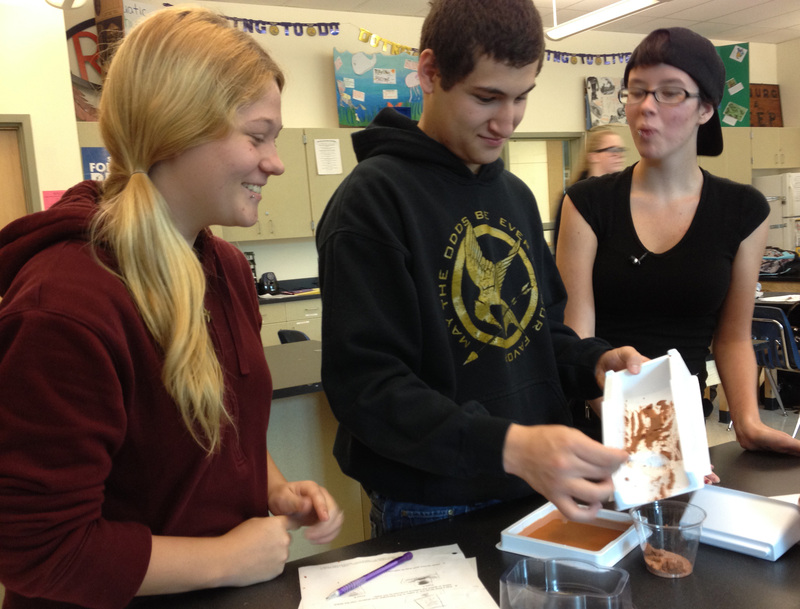 Like Carson, Roseburg High senior Phillips can recall being introduced to CTE subjects in middle school – in his case, as an eighth-grader attending a tech night at RHS. At his first drafting class, with instructor Ron McGuire, “I got it immediately and it made sense. Everything clicked,” Phillips said. His enthusiasm grew as he took related classes, dealing with architecture and computer numerically controlled (CNC) machines. During his junior year, Phillips’ drafting teacher, Kyle Dever, suggested that Phillips call Gary Matthews of North River Boats to follow up on a job lead. In the fall of 2014, Phillips was hired to help with CNC programming at the plant. Matthews, the company’s fabrication department manager, said he worked closely with Phillips at first on how the software worked, following a natural progression of learning continually as the new hire gradually became more efficient and independent. Though he enjoyed the challenges of drafting, mastering new software and progressing to three-dimensional projects as opposed to strictly programming, Phillips ultimately decided that firefighting offered him a more dynamic future than engineering. Nevertheless, he credits his CTE and North River Boats experience with teaching valuable lessons. Kurt Phillips looks forward to continuing his UCC courses and becoming a firefighter and paramedic. “It really helped me know what I want to do, and how to problem-solve and work with other people,” he said. Though Carson and Phillips are taking paths that veer from their original CTE experiences, they both appreciate what their work experiences contributed to their overall career journeys.